Sons of a count, the lords of Bolanden, brothers, cheated their blind sister out of her inheritance following the death of their father. They became bitter enemies and built a wall to divide the two castles. It didn’t take long for them to lose their inheritance, and when they tried to reconcile, one accidentally killed the other. The surviving brother traveled to the Holy Land and died there. In 1529, the castle was barely habitable and was abandoned by the end of the century. The property fell once again into inheritance disputes this time between Emperor Ferdinand II and the House of Nassau-Saarbrücken. Finally, in 1793, a Baron Preuschen acquired the castle and his descendants oversee it today. There is no elevator here, so if you have a hard time negotiating a flight of steep stairs, this may not be the right castle hotel for you. Although the parking is a little tight, it’s free. Also, the guest rooms have neither TV nor Internet, so try to go unplugged for a few days. It’s worth it! Kamp-Bornhofen is on the east side of the historical Rhine River, south of Koblenz and across the river from Boppard. From the train station or the cruise boat landing stage, it’s about a 5-minute walk to Hotel Garni Café Nickenig Rheinischer Hof, and from there a transfer service will take you to the castle hotel. Perched high above the Rhine River, this traditional castle hotel exudes loads of medieval character. Family run, you’ll find a personal and friendly touch from the guest rooms to the cozy restaurant. Everywhere you look something will remind you of the castle’s origins. It can be a suit of armor, some romantic castle ruins to explore, or the arched windows that give an eagle’s eye view of the Rhine boat traffic. A small, low-ceilinged spiral staircase leads up to a few of the rooms. Be sure to watch your head! Guest rooms are charmingly and individually decorated. They can be furnished with a canopied bed, open fireplace, beamed ceilings, stone walls, light sconces, and Oriental carpets. The guest room on the top floor has a four-poster bed, as well as a spectacular view of the Rhine and nearby Castle Sterrenberg. A tower room holds two window seats in an alcove—also with river views. Bathrooms are equipped with showers. 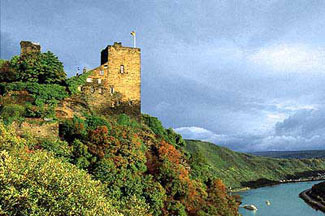 The castle restaurant serves classic and well-prepared German cuisine. If the weather is good, you can enjoy a sunset dinner with a glass of local wine in the courtyard. And of course, what’s a castle without a resident ghost? The Baroness of Liebenstein comes out at night on the twisting staircase to haunt the guests!